What's happening here? Is this no longer updating? item = "|cff0070dd|Hitem:33820:::::::581060221:100:102::::::|h[Weather-Beaten Fishing Hat]|h|r"
_ = "Weather-Beaten Fishing Hat"
link = "|cff0070dd|Hitem:33820:::::::581060221:100:102::::::|h[Weather-Beaten Fishing Hat]|h|r"
Last edited by Ravenslair : 07-19-16 at 06:10 PM. Is it possible to (commit blasphemy) hide the tooltip info? As I'm using TradeskillMaster, The Undermine Journal's tooltip is a bit unnecessary for me. I searched through the documentation and comments on the various sites, Stormspire, WoWInterface and another addon site but I found nothing. Thanks for the help and for maintaining this addon. I'd suggest putting it in a fresh new macro, accessible via the game menu (or typing /macro), that way you can declutter and reclutter your tooltips on demand! Last edited by Narlash : 05-31-16 at 02:39 PM. thank you so much for bringing this back! absolutely fantastic. I love The Undermine Journal, thank you sir for making this AddOn happen. 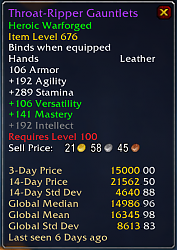 Is there a way to find out on what server's auction house a particular item was posted? I'm seeking an extremely rare BOE green that hasn't been seen lately on any of my server's auction houses (it says Long Ago for all 3 on the website). 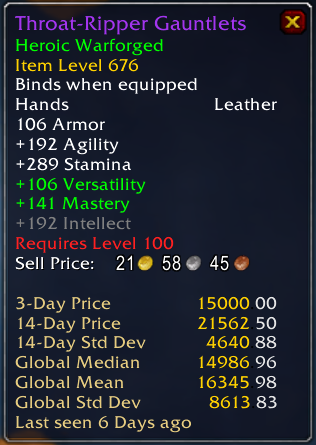 But, the Undermine tooltip information lists the Market Mean as 17k gold, which means it's been posted recently on some other US server (the price of this item didn't get inflated until transmogging became available in Cataclysm). I don't have the patience to go through every single server's auction house on The Undermine website, and was hoping there was an easier way to access this data. I'd like to know because I am willing to transfer servers to pick up this item. Thanks in advance for letting me know if this is an option. Ok I submitted my signature to petition SOPA. May I now have my data for H-Uldaman server plz? I get it, doesn't mean it's not annoying and inconvenient while trying to update this thing lol. Last edited by moondoggy : 01-18-12 at 11:46 AM. Do you have an SVN for this? It would make updating this addon a lot easier. This looks amazing! I registered on the site and got my server version. I just wish I could try it, but it's Tuesday and servers are down lol. I have to say that I did not expect to like this mod as much as I do! I had been using Going Price, but this is so much more accurate and so much easier to get the trends for my server without the AH Scan BS. To anyone who has not tried this and wants to get server specific info read through the AddOn description and follow the link to the Undermine Journal AddOn Page. Last edited by Moosetrax : 05-09-11 at 06:54 PM.